COLTECH® GRIPELAST is a superior, water-based, hard-elastic, modified Polyurethane texture coating, providing high traction and non-skid properties, extreme durability, UV and water resistance, high elasticity to prevent cracks and provide a comfortable feeling while walking and optically appealing results. COLTECH® GRIPELAST is an easily applied water-based non-skid coating free of harmful volatile organic solvents. According to your needs, the texture of the surface can be adjusted from a rolled "pleasure boat" texture to an industrial grip "work boat" texture. Ypour boat deck will look new again and will be protected from the combined weather influences and heavy use. Compared with conventional Marine non-skid deck coatings, COLTECH® GRIPELAST will function and protect your surface for many years to come without the need of grinding and reapplication. Yachts and workboats are permanently exposed to a combination of moisture, saltwater and saltwater spray. The result is slippery and dangerous decks, stairs and external surfaces that can potentially result to serious injuries. The solution is offered by COLTECH® GRIPELAST the advanced Non-Skid Deck Coating. The Coltech Gripelast is a superior, water-based, hard-elastic, modified polyurethane texture coating, providing high traction and non-skid properties, extreme durability, UV and water resistance, high elasticity to prevent cracks and provide a comfortable feeling while walking and optically appearing results. 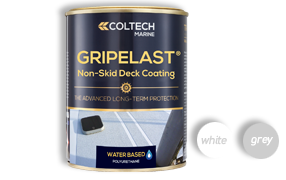 Compared with conventional marine non-skid deck coatings, Coltech Gripelast will function and protect your surface for many years to come without the need of grinding and reapplication. 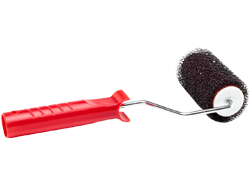 The Coltech Gripelast Roller is a specialized roller for use with the Coltech Gripelast coating in order to produce the texture, anti-skid surface.